The new AFA website is live and we invite you to go take a look! 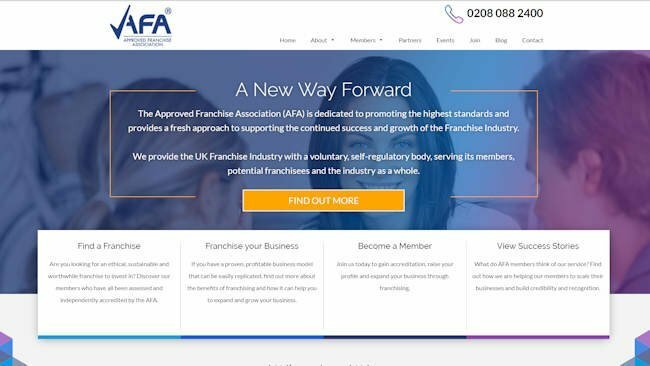 Having undertaken extensive research to find out exactly what our members and partners need from us, we have produced a website that aims to reflect our growing presence within the franchising industry accurately. Our new website provides a clearer picture of who we are, what we stand for and where our values lie in supporting the industry as a whole. The website boasts a clean, new design and improved menu functionality, enabling members, partners and franchisees to find the information they’re looking for quickly and easily. It is also fully mobile-compatible, allowing you to navigate with ease on most web browsers and portable devices. In partnership with Induction Junction, the AFA is now able to provide members with access to a professional training system that offers our members online compliance training, specifically designed to protect and enhance their franchise networks, covering topics such as Data and Fraud Awareness, Risk Assessment and Health & Safety. AFA members receive a reduction in course fees that can be further reduced by ordering more than fifty licenses. The website still provides access to our popular blog so, going forward, you can continue to receive our news updates and communications, as well as find out about our members and their franchise opportunities. I’m really proud of the new AFA website and hope you’ll be impressed too! Please visit us at www.theafa.org.uk and let us know what you think of the new design.